吴红照, 刘营, 黄文忠, 凌锋, 楼永锦, 孙继民, 龚震宇, 侯娟, 陈恩富. 浙江省浦江县“无蚊村”建设的效果评价[J]. 中国媒介生物学及控制杂志, 2018, 29(3): 283-286. WU Hong-zhao, LIU Ying, HUANG Wen-zhong, LING Feng, LOU Yong-jin, SUN Ji-min, GONG Zhen-yu, HOU Juan, CHEN En-fu. Evaluation on construction of "mosquito-free village" in Pujiang county, Zhejiang, China[J]. Chin J Vector Biol & Control, 2018, 29(3): 283-286. Corresponding author: CHEN En-fu, Email:enfchen@cdc.zj.cn. Abstract: Objective To investigate and evaluate the constructive process and effect of vector control which based on the construction of "mosquito-free village" in Xuexiazhuang village, Pujiang, Zhejiang province, and then to provide experience for mosquito control in rural areas. Methods The adult and larval densities were monitored with lamp traps and 100-household index respectively from April to October in each year from 2016 to 2017. A random sampling method was adopted to select 50 households in pilot and control villages from which one family member was surveyed. The face-to-face questionnaire was about the anti-mosquito related knowledge, attitude and behaviors. Examination and evaluation of construction mode of "mosquito-free village" was deeply explored via the method of interview, data review, on-site observation. Results Monitoring results of Xuexiazhuang village from April to October 2017 showed that the adult mosquito density was 0.50, 0.50, 0, 0, 0.75, 0, 0 individual per lamp trap per night, respectively, and the 100-household index was 18.00, 4.00, 4.00, 2.00, 0, 2.00, 2.00. The awareness rates of anti-mosquito and correct behavior formation reached 82.80%, higher than that in the control village (67.80%). The construction of "mosquito-free village" is much more institutionalized and standardized than before, and the long-term mechanism has been formed. Conclusion The mode of rural mosquito control based on "mosquito-free village" can effectively reduce the density of mosquitoes. Formation of institutionalized, standardized long-term mechanism of "mosquito-free village" construction work may provide reference for a much more scientific, effective, low cost and sustainable development of vector control in rural areas in the future. 孙洪清, 肖宏, 陈良. 重视蚊媒传染病[J]. 医学研究杂志, 2016, 45(9): 1-3. Gautam R, Mishra S, Milhotra A, et al. Challenges with mosquito-borne viral diseases:outbreak of the monsters[J]. Curr Top Med Chem, 2017, 17(19): 2199-2214. Roth A, Mercier A, Lepers C, et al. Concurrent outbreaks of dengue, chikungunya and Zika virus infections-an unprecedented epidemic wave of mosquito-borne viruses in the Pacific 2012-2014[J]. Euro Surveill, 2014, 19(41): 20929. Sakkas H, Economou V, Papadopoulou C. Zika virus infection:past and present of another emerging vector-borne disease[J]. J Vector Borne Dis, 2016, 53(4): 305-311. 世界卫生组织. 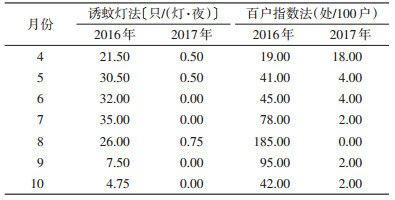 2017年世界疟疾报告: 主要信息[EB/OL]. (2017-11-29)[2017-12-27]. http://www.who.int/malaria/media/world-malaria-report-2017/zh/. 邹钦, 许立凡, 陈绍文, 等. 农村病媒生物控制工作模式的初步探讨[J]. 中国媒介生物学及控制杂志, 2013, 24(1): 86-87. 刘起勇, 孟凤霞, 鲁亮, 等. 探索中国病媒生物可持续控制之路[J]. 中国媒介生物学及控制杂志, 2006, 17(4): 261-264. 中华人民共和国国家质量监督检验检疫总局, 中国国家标准化管理委员会. GB/T 23797-2009病媒生物密度监测方法蚊虫[S]. 北京: 中国标准出版社, 2009. 白勇, 朱光锋, 胡宁军, 等. 宁波市PCO现状与服务质量的管理[J]. 中国媒介生物学及控制杂志, 2011, 22(2): 182-183. 蔡建民, 陈志健, 楼晓明, 等. 浙江省部分农村环境卫生现况调查[J]. 现代预防医学, 2014, 41(8): 1380-1381, 1390.